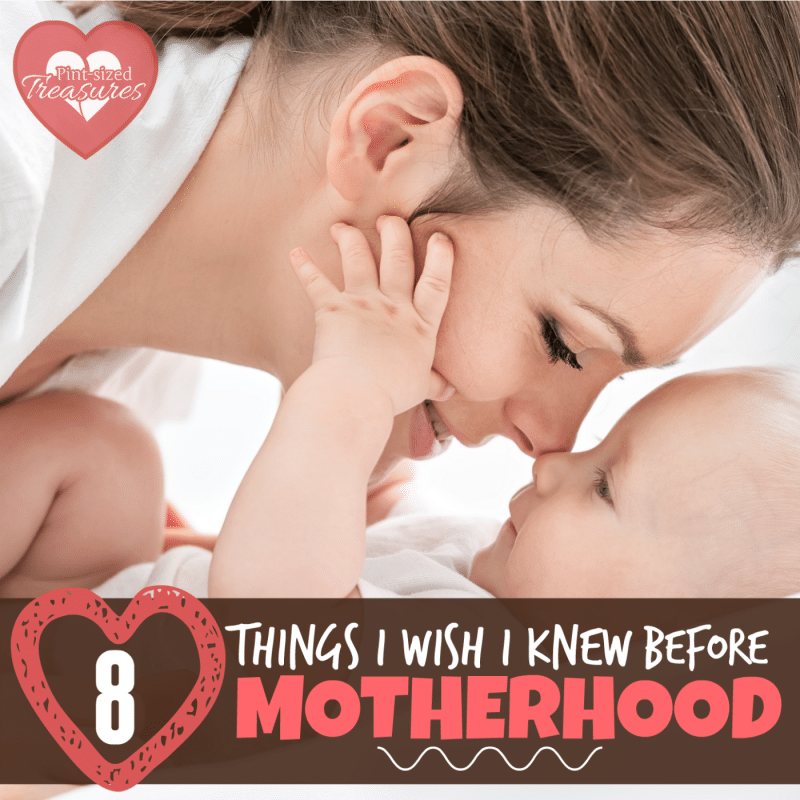 Have you ever taken the time to think about things you wish you knew before motherhood? Many moms jump in completely unprepared — at least I was! If you’re a new mom, I hope this open and honest post helps prepare you for the amazing journey on which you are about to embark. It will bring tears, laughter and irreplaceable memories to your life. Yes, it’s a daunting, difficult task, but it’s worth every bit of energy and time you invest in it. Parenting is not a contest. Many times I would compare my first child to other babies his age. If they were sitting up at five months, he should be too! Was their baby sleeping through the night at 8 weeks, then mine should be as well! No one took time to lean over and whisper, “This is not a competition, Alison.” So, I acted like it was. Even when it came to older kids things like riding bikes and learning to read — my child had to be the best! After a few more kiddos, I realized that children are individuals and develop at different times. Just like us, they have various areas of strengths and weaknesses. When my third child didn’t walk until she was 15 months old, I didn’t sweat it. Though other people made snarky remarks about her being a late-walker, I trusted that she would walk in her own time — and you know what? She did. All kids are not created equal. I have four little munchkins that are currently in school. Two are accelerated and challenged by schoolwork while the other two are slower and less enthusiastic learners. Some of my kids are very social and love interaction, while others prefer to play alone in a quiet atmosphere. Each child has his or her own individual personality, and as a parent I need to work with that. I do not need to mold my child into being something that he or she is not. Sleep is a distant dream.There are no more infants in my home, only toddlers and school-aged children. However, I still have sleepless nights and very early mornings. Many times my preschoolers wake up as the sun rises and ask for breakfast. Night-mares may wake up a kid or two each week. Some of my kids have experienced bed-wetting issues and needed help changing clothes and sheets during the night. At other times, I would have to stay up to offer comfort to a feverish child. Sleeping in on Saturdays is a long-lost memory. Stain-remover is a must. Spit-up, ketchup, kool-aid, mustard and mud all seem to attach themselves to my kids’ clothes. Long gone are the days when I could just throw the dirty clothes in the washing machine and and push the start button. After kids come on the scene, laundry has to be examined and pre-treated before washing or the majority of your child’s garments are going to be pretty scary. Stain remover is always on our shopping list! You will bid “adieu” to breakables. Expensive scented candles, decorative hanging plates, framed pictures and other breakables are non-existent at my house. Many times I have heard a shattering noise followed by sobs as one of my children had broken another item in my home. I try to remind myself, “It’s just stuff. It’s just stuff.” But it’s always hard to forget that I paid for that stuff, or that stuff was a special gift. So if you are highly attached to your fragile items, stash them away for a few years. Walls were made for coloring. I always thought walls were made for protection and privacy — but not in a mom’s world! All six of my kids have proved me to be in error as they have let my walls become their canvases for colorful masterpieces. I constantly remind my kids that paper and coloring books are made for crayons and colored pencils — not walls. But my reminders prove to be futile — over, and over again. What’s my advice to new parents? Invest in Mr. Clean magic erasers — a lifetime supply. Moms need to just relax. Many time we put more duties and expectations on ourselves that anyone else would. Take time to enjoy bathing your little one, breathe in the new baby smell, rock your babies during the day and stop rushing through feedings. Enjoy this time and relax. Take a breather if you need to take time to chill out, but just RELAX! Many women have done this “mom thing” and so can you! If you mess up, don’t worry — every mom has sometime in her lifetime. One day you will have a super-clean house, lots of sleep and no tiny one to cuddle. but for now, enjoy your tiny bundle and enjoy being a mom! Parenting is the best job in the world! Ah! Yes, this is so true! I cannot begin to explain to the mom-to-be how precious it is to hear your child say “Mama” for the first time — though many times a baby’s first word is “DaDa.” I could try to explain how it feels to hold a newborn who only finds solace in your arms and no one else’s. I would also fail to convey the joy of having your child’s eyes light up when you return home from a date with your husband. You see, for just a few years, you are the center of a beautiful little human being’s life. You are their joy. You make them laugh and you dry their tears. If a child has to choose between his teddy or his mom, he’s going to pick his mom. No one can replace you in your child’s heart. Yes, being a mom is the best job in the world and THAT is one thing I wish someone had told me before I became a mom. 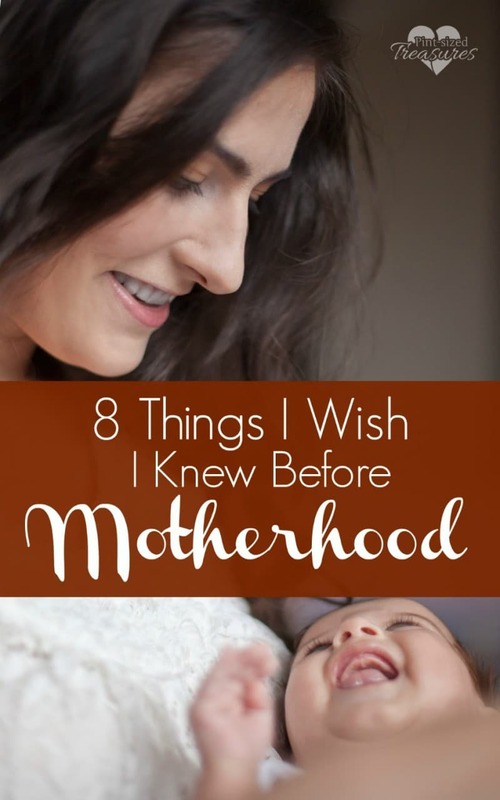 What is something you wished you had known before motherhood? Share it with us on social media!